Sometimes, our gardens get out of control and suddenly you have a towering tree or even a sprout of an invasive species growing in your yard. Try not to get to attached to these sprouts as many of these invasive species have unwanted attributes that will only cause problems down the road, like weak wood that will break in storms and littering your yard with suckers that will seed and destroy your lawn. Invasive species are defined as a species of plants that are not meant to grow in a certain area, as it’s foreign and therefore disrupts the ecosystem of your yard and even your neighbor’s yard. So how do you identify a tree that could be a potential problem? We’ll show you a couple of invasive species that are particularly worrisome and how to watch out for them. Although the leaves are especially fragrant, the blue gum eucalyptus is not the best tree to have in your yard, despite its beauty and its propensity to grow to incredible heights. It’s known by many names such as the Tasmanian blue gum or common eucalyptus and its origins are looped back to Tasmania and south-east portion of Australia. It can get up to 98 to 230 feet tall and is known for its stunning, smooth white bark that is extremely flammable. Though it smells nice, it can spread wildfire enthusiastically since it burns so easily. It’s prone appearing in warmer areas of the U.S. and likes to bother the California forest officials since they remain in fire-prone places. Even if the tree is burned or cut down, it’ll need a coating of herbicide or else it’ll grow back. You’ll find that coating the stump with special herbicide is a particularly important part of removing most of these invasive species. You’ll recognize it by its elongated leaves and small round red berries that sprout on separate branches. It’s invasive in an elaborate and different way than most trees are in that it spreads its seeds through being eaten by birds and displaced from within the bird’s droppings. It’s rather averse to sharing sunlight and so it’s canopy is thick enough to make it difficult for other plants to grow near it and it performs allelopathy on the soil surrounding it, making its surrounding area rather inhospitable. The tree will even go so far as to make the soil more alkaline in its general vicinity through the fallen leaves which makes it nearly impossible to grow other plants near it. If you decide to keep the tree despite these attributes, be sure not to use the berries for food as they’re poisonous to humans, though they make lovely beads for rosaries and necklaces. Halo Tree Service proudly eliminates invasive and dangerous tree species for the Shelby Township area. 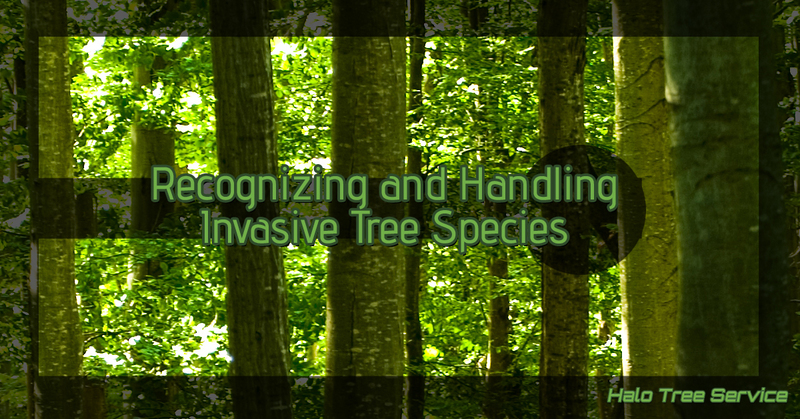 Our tree removal services are dynamic and adaptive so that we can properly handle an invasive species. We can coat the stump with herbicide and even go so far as removing the stump to see if that prevents the species from trying to return. Whatever your tree needs are, whether it’s pruning or full removal, we’re prepared to help you form the outside space you’ve always dreamed of. Reach out to us to chat about your tree services.